Viewed by a casual and untrained eye, the cleanly incised flat sandstone above a ledge on the cliff face looks like the early stages of the carving of one of the hundreds of tomb façades in the area. But this is not an unfinished work mysteriously frozen in time: It is one of four large-scale quarries. Here, some 2000 years ago, Nabataean masons split, hewed and carved out building blocks for their homes, markets and wells in Hegra, the second-largest city of their realm, today known as Mada'in Salih, Saudi Arabia's most famous archeological site. At another quarry nearby, the Nabataeans lowered a sandstone ridge by an estimated five meters (16') as they split off rock in successive layers. To this day, debris still lies along the leveled surface, and deep incisions in the floor of the cut indicate both the size of the blocks and the techniques of carving them out. These long-abandoned quarries vividly contradict a stereotype of the Nabataeans, who ruled northern Arabia and the southern Levant for some four centuries before the Romans conquered them. Renowned as carvers of iconic, natural-rock necropolises, they have been regarded only passingly, if at all, as builders. The quarries of Hegra are evidence that the Nabataeans were capable of more. 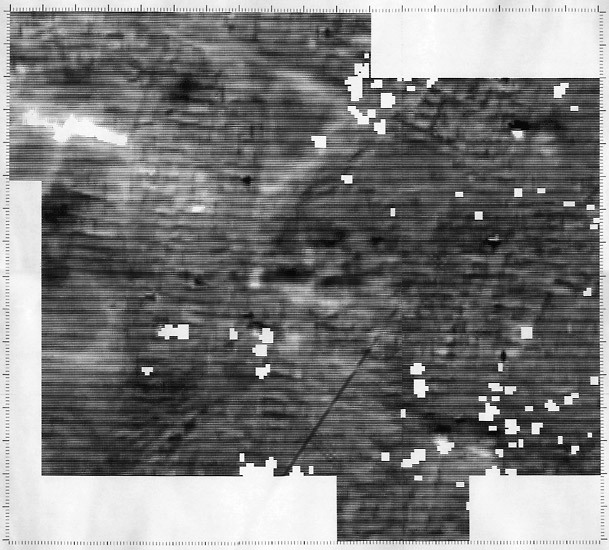 Using geophysical detection techniques, archeologists can peek before digging: This image shows a rough grid of unexcavated homes, market stalls, roads and possibly temples. Archeologists have determined the maximum extent of the Nabataean kingdom largely through finds of distinctive pottery at more than 2000 sites. At its zenith, Nabataea extended over much of what is now southern Jordan, Syria and the Negev and south into northwestern Arabia. It was from Hegra, the kingdom's southernmost settlement, emporium and entrepôt, that long-distance camel caravans set out for the far reaches of the Arabian Peninsula in pursuit of aromatics, spices and other rare commodities, some of which came from India and even China. Of the historic Nabataean centers, the largest is their capital Beqem, now known as Petra, in Jordan. There, more than 600 tombs, paved streets, temples, markets, a theater, hydraulic installations and dwellings, including elaborate villas, have made it one of the best-known historic monuments in the Middle East. Such was its status that, after imperial Rome annexed Nabataea in the year 106, the Romans accorded Petra the honorific title of metropolis, and the Nabataeans continued to coexist with their occupiers. Hegra ("Rocky Tract") is now known as Mada'in Salih, or "the cities of Salih" in Arabic. (The name refers to the pre-Islamic prophet Salih, whose rejection by the people of Thamud is recounted in the Qur'an.) Set in a coarse-sand highland plain studded with apricot-colored sandstone outcrops, Hegra was the southernmost Nabataean settlement and a center for the kingdom's traders, farmers, engineers, stonemasons and artisans. Now, between 2008 and 2012, it will be the focus of a new phase of excavations and studies—the most extensive to date—under a Saudi–French program that will bring archeologists, epigraphers, numismatists, topographers, ceramists, paleobotanists, anthropologists, geophysicists and draftsmen to the site. "Apart from the big quarries, there are at least 20 small ones, each likely located near a building under construction," explains archeologist and epigrapher Laïla Nehmé. "I do like quarries, but I'm also interested in small monuments and artifacts: These are often the significant elements that reveal most about everyday life. Many people think that the tombs are the most important feature in Mada'in Salih." A world authority on the Nabataeans, Nehmé is the joint director of the French team of some dozen experts who will work alongside Saudi archeologists. "We already know a lot about the Nabataeans, except for their southerly reaches, south of Wadi Rum in Jordan. From here, for some 400 kilometers [250 mi] to their Arabian frontiers, we know very little," Nehmé explains from her Paris research base in the Laboratoire des études sémitiques anciennes. 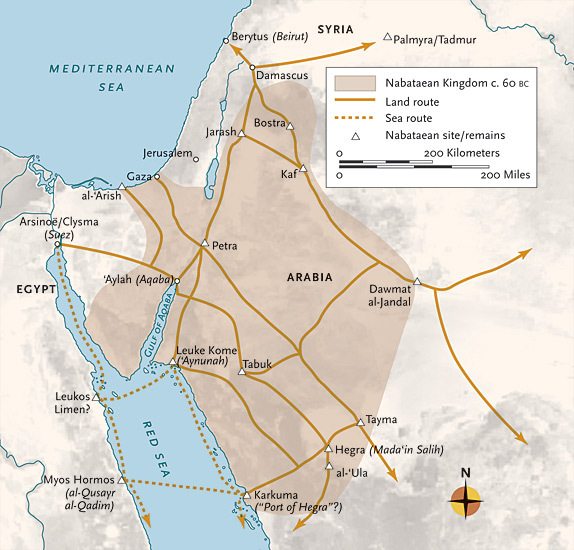 "Mada'in Salih is considered central to understanding the connection between the core region of Nabataea and the southern parts of their kingdom, and their long-distance trading links with South Arabia, the Gulf and beyond, as well as their more proximate links to the Red Sea, their capital to the north and the eastern Mediterranean littoral. This therefore is a very significant missing piece of the jigsaw puzzle." "Jigsaw" is a term also used by other scholars when they refer to the slow unraveling of the story of the Nabataeans. Philip Hammond, director of the American Expedition to Petra, writes of the "kaleidoscopic jigsaw puzzle of passing references, known sites, architectural remains, ceramics, religion, inscriptions, economic strands, politics and other sundry bits and pieces." Hammond, professor emeritus at the University of Utah, argues that if we weave these together "with the background fabric of their era," we will be able to reconstruct a great deal more of Nabataean cultural history and understand more of "this enigmatic group of bedouin pastoralists which became possibly the major commercial nation in the Middle East in the days of Augustus Caesar." The quarries at Mada'in Salih represent just one piece of the puzzle from which the joint team hopes to tease answers. "Where was the quarried stone being used?" asks Nehmé. "And remember, in addition to the stone from the quarries, there were enormous quantities of cut stone and building material coming out of almost 100 rock-cut tombs. We know this stone was used for building, as there is no evidence of spoil heaps. This is certainly a missing link, a puzzle for us to look at solving," she says, adding that the puzzle is made more complex because, thus far, no inscription or evidence has been found that can accurately date the quarries. What is more puzzling still is that across the open desert plain amid Mada'in Salih's clusters of carved tombs, there is not a single visible trace of a building of any kind. Answers lie unseen, near the quarries and sandstone outcrops, and underground, buried beneath layers of sediment borne over centuries by wind and water. One extensive, slightly sloping area is littered with a mixture of stones, sherds and other debris that shows clear signs of human settlement. It has been fenced off by the Department of Antiquities within the guarded and fenced main site (which encompasses 14.5 square kilometers, or 3583 acres) and it is here that the buried remains of the residential area of Hegra lie. A tennis court-sized area has already been partially excavated, revealing foundations and the lower stone parts of dwellings and other buildings, as well as remains of a wall. Using existing survey evidence and recent geophysical detection data from tens of thousands of differential magnetometer soundings, archeologists have traced out the buried remains of Hegra's walled urban center, which covered about 650,000 square meters (160 acres). This was just one of the destinations for the sandstone blocks hewn from the quarries and cut from the sandstone cliffs as the Nabataeans carved out their tombs and burial chambers. Leading the Saudi team of archeologists at Mada'in Salih is Dhaifallah al-Talhi, head of research and survey at the Saudi Department of Antiquities, based at the National Museum in Riyadh. A quietly charming and unassuming expert with more than two decades of surveying, excavating, recording and reporting at Mada'in Salih under his belt, he has clocked up more "dirt time" at the site than any other archeologist, and for him, the residential area has always been the most interesting. He spent several seasons uncovering a small portion of it, and during the most recent season, he was rewarded with an important find. "We came across a courtyard paved with stone, revealing a stairway and columns. This is significant enough, for it represents the first discovery of a paved floor at the site." But there was something better: "At first we thought it was part of the pavement buried in the soil. Once we removed the meter-thick [39"] layer of hard mud, sand and dirt, we realized we had found a sandstone block engraved with a complete Latin inscription. It was in very good shape, with just a few letters lost," recalls al-Talhi. Translated, the inscription throws new light on the little-known Roman links with Hegra—and it overturns current thinking. Unlike Petra, where only one tomb has a dated inscription, one-third of the monumental tomb façades at Mada'in Salih have them, and all range from the year 1 to the year 75 of our era. This might suggest a short period of Nabataean occupation, and al-Talhi cites several authorities on Roman Arabia who have suggested that the Nabataeans may have withdrawn from the area of Mada'in Salih after the year 75. 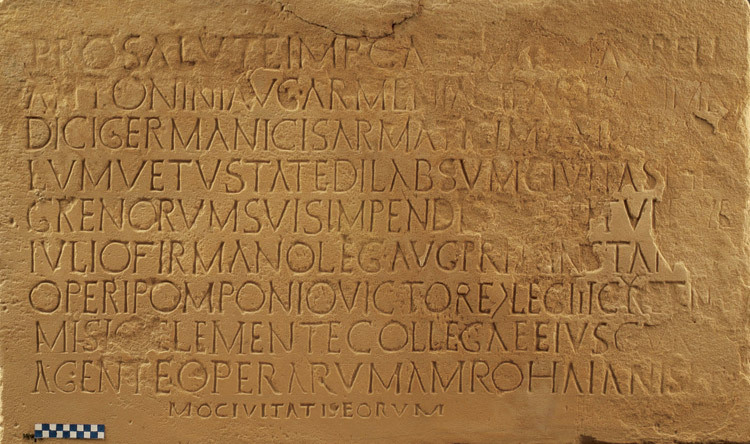 However, the inscription (at right), dedicates the restoration of the Nabataean covered market (or wall—macellum) at Hegra under the direction of a headman with a Nabataean name. It involves Emperor Caesar Marcus Aurelius and presents all of his titles, by which the inscription can be dated fairly precisely to between the year 175 and the emperor's death five years later. This is significant, and so is the inscription's implication that at the time of its writing—in the late second century—there still existed at Hegra a rather large city where a Roman legion was stationed. "For the welfare of Emperor Caesar Marcus Aurelius Antoninus Augustus Armeniacus Parthicus Medicus Germanicus Sarmaticus Maximus, the community of the Hegreni restored the wall, destroyed by the passage of time, at its own expense, under the governorship of Iulis Firmanus, legate of the emperor with the rank of praetor; the work being arranged by Pomponius Victor, centurion of Legion III Cyrenaica, and his colleague, Numisius Clemens, and construction being supervised by Amrus, son of Haian, the headman of their community." The inscription's late date "throws new light on Mada'in Salih and the time line of its existence," says al-Talhi, adding that with the documented life of the settlement now extended by a full century beyond what was previously known, "the entire history of the occupation and later abandonment of Hegra has to be reevaluated. We now have to establish what happened to the Nabataeans in the century following the year 75." The inscription's reference to the initiative to restore the market or wall also contradicts scholarly opinions that there was disunity among Nabataeans after Roman occupation, and shows rather that there was at least some cooperation and coexistence between the military commanders of the Roman armies in the region and the Nabataean inhabitants of Hegra. American archeologist, explorer and scholar Nelson Glueck (1900–1971) was one of the first to write and elaborate on the varied accomplishments of the Nabataeans, beyond their standard characterization as tomb-carving caravaneers. "They were one of the most gifted peoples of history," he wrote in Deities and Dolphins (1965). "Theirs was a record of remarkable accomplishment, extending from commerce to agriculture and from engineering to architecture and art." Dotted across Mada'in Salih there is also abundant evidence of the Nabataeans' "prodigious feats of imaginative farming" and their masterly utilization of scarce water resources. This will provide another focus for the Saudi–French team's excavations and fieldwork. The Nabataeans were expert hydraulic engineers, and their skills in constructing wells, cisterns, runnels and aqueducts enabled them to develop advanced agriculture and practice soil conservation. At Petra, however, there are no Nabataean wells: Water from springs and channeled runoff fed more than 200 rock-carved cisterns. By contrast, at Mada'in Salih there is no evidence of surface springs; the Nabataeans here depended on more than 130 wells and channeled their sporadic rainfall into cisterns cut into the sandstone. The wells gave access to a water table that, two millennia ago, was likely about five meters (16') below the surface. The Nabataean wells are stone-lined for the first few meters of their depth—revealing yet another destination for the stone cut from their quarries. The numerous old wells scattered around the oasis supported extensive cultivation. Today, the water table has dropped to below 20 meters (65'), yet local Bedouin and other contemporary settlers have made use of the original Nabataean wells, clearing them and boring them deeper. At one, near a cluster of now abandoned mud houses, smallholders ingeniously lowered a water pump three meters (10') below ground level, supporting it on a length of iron rail set across the well's diameter. The rail, stamped "Providence Russe 1906," is a salvaged remnant of the nearby Ottoman Hijaz Railway, whose Mada'in Salih station complex, with engine repair sheds, double water tower and barracks, is almost within sight north of the tombs. Still other wells are outside the fenced antiquities site, and it is here the archeologists are hoping to find a suitable target for excavation. "Silted wells that have not been reopened can reveal much, and we're looking forward to significant pottery finds," says Nehmé. "We want to carefully excavate at least one well, and we need to find one which has not been reused in the 19th and 20th centuries and which is also not too dangerous because of collapsing walls." Investigations during the coming excavation seasons will go beyond the residential and oasis areas. Mada'in Salih holds 94 tombs with decorated façades, 35 plain funerary chambers and more than 1000 non-monumental graves and other stone-lined tombs. "We plan to excavate two or three monumental tombs that appear not to have been robbed, and we will be looking for other unviolated burial chambers," explains Nehmé. A precious few fragments of Nabataean textiles, rope and other organic materials have already been found, and now there is the prospect of more, perhaps even skeletal remains. The discovery of textile fragments and the analysis of the ointment which might be found on some of them can provide new information on the still little-known burial practices in the Nabataean realm. The city walls that enclosed the residential area are evident from aerial photographs taken in 1978 and from satellite imagery. Nehmé explains that the new geophysical detection evidence reveals open areas and suggests that perhaps some areas within the walls were not so built up. "The city walls appear to have been constructed at an early stage and the city then extended up to them," she explains. Today, as Saudi and foreign visitors continue to pass through the site, there is an increasing interest in developing the area as a major attraction. In the town of al-'Ula, some 25 kilometers (15 mi) to the south, two hotels now offer organized tours to the Nabataean site as well as other places in the highland desert. Work on an airport has started; new highways connect the area with Madinah and the Red Sea coast. The United Nations Educational, Scientific and Cultural Organization (UNESCO) is considering naming the area a World Heritage Site. Ali Ayed al-Faqeer was born in what is now the antiquities area, and his ancestors lived in Mada'in Salih proper, where they used a few of the Nabataean wells for their own agriculture. Over more than two decades, al-Faqeer has met archeologists and other specialists from around the world, absorbed lore from fellow tribe members and others who have lived in the area for generations, sat in on discussions with Saudi scholars over countless servings of coffee, pondered Arabic texts and read Qur'anic references. He now spends some of his time guiding visitors around the site, and he is working on a book to present his interpretations and theories on the Nabataeans. "I remember when I was young we used to get a kilo bag of sugar in exchange for a Nido [powdered milk] can full of Nabataean and Roman coins that we had picked from the site. No one seemed that interested in what was here," says al-Faqeer. Things have certainly changed, and he talks animatedly about the Nabataeans by way of presenting his hypotheses: There are undisturbed tombs outside the known site; colored plaster once lined the now-bare tomb chambers and paint colored the tomb facades; a mountaintop beacon lit the way at night for caravans. Perhaps most contentiously, he asserts that the tombs of Mada'in Salih were built by Roman masons and slaves captured by Nabataeans. However controversial and perhaps homespun they may appear, al-Faqeer's ideas reveal the growing popular fascination that the Nabataeans hold, and they illustrate also the learning process still under way amid the many unsolved mysteries of Nabataean civilization. And al-Faqeer's deep roots in the area offer an intriguing recent parallel to the story of the Nabataeans' own transition from nomadic to sedentary life: Just a few generations back, his Bedouin ancestors lived in tents as pastoralists; with the unification of the Saudi kingdom, they settled and now live comfortably in a modern, irrigated farmstead along the paved road that encircles the historic site. As if to reinforce the analogy, an entirely new tract of homes, platted on paved street grids with pre-installed street lighting and utilities, sprang up last year just a kilometer or two from the site's main entrance on the open sands of the plain on which Nabataean settlements may once have flourished. Peter Parr, who taught at London's University College Institute of Archaeology for more than 30 years, has had a lifelong scholarly interest in Nabataeans, and participated in early excavations at Petra and Mada'in Salih. He started off in Petra in the 1950's, focusing on the settlement areas, which had, until then, been largely overlooked in favor of the rock-cut monuments. In the 1960's and 1970's he also participated in the first comprehensive archeological surveys in Saudi Arabia, which included Mada'in Salih. Now retired, he maintains an active interest in studies of the Nabataeans, and he plans to lead a tour of museum members next year called "In the Footsteps of the Nabataeans." "With Mada'in Salih, just as with Petra, actual origins are still very much a mystery," says Parr. "When was the settlement formed? What was the nature of the early settlement? What were the stages of its growth, and how was the settlement financed?" One of the problems with studies of the Nabataeans, he adds, is the dearth of documentary evidence. "We are not really sure what Mada'in Salih actually was: a frontier town, a military base or an administrative and customs center. This new and major phase of excavations will help us understand the true nature of this settlement." Perhaps as he guides his tour over the site next spring and poses the questions, a new generation of young Saudi and French archeologists working with his longtime friend and colleague al-Talhi will be uncovering more new pieces of the tantalizing puzzle of the Nabataeans at Mada'in Salih.